HILL CLIMB AND SPRINT - SPEEDSCENE MAGAZINE! 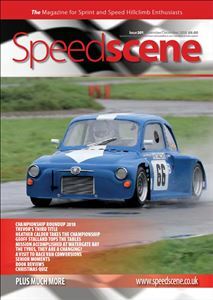 Speedscene is a highly regarded magazine published by the HSA five times a year and is the only full size UK publication dedicated to the sports of speed hillclimbing and sprinting. Speedscene is free to HSA members and and available on subscription. It contains reports, articles, photographs and features covering all aspects of the sport. The high standard of production of the magazine and its A4 full colour format sets it apart from the normal club publication. The Christmas issue of Speedscene features a Steve Wilkninson cover photo of Ian Medcalf's unique 1.4 Fiat 500 at a wet Curborough. There are reports of the concluding rounds of the exciting British Hillclimb Championahip from Prescott, Doune and Loton Park. The British Sprint Championship finishes with reports from Blyton Park and Anglesey while the HSA Speed Championship reports include MIRA, Shelsley and a pair of Curboroughs. Between the Beams covers the new hillclimb event at Watergate Bay (also with a background report by Andrew DInner later in the issue), a report of the BOC/ALDON Classic championship and a results round up of all the major championships. Peter Herbert reminisces over his British Hillclimb Championship points scoring exploits at Craigantlet in 2010 with his Westfield. 7OAKS MC preview the return of sprinting to Cryatal Palace in 2019 with a report of the event's history. Chris Bennett describes how Pirelli have entered the market with racing tyres for hillclimbing and sprinting and Les Buck previews moves to make the 600cc racing car class better supported in 2019. There is a visit to Race Van Conversions who are producing an affordable motor home/ support vehicle and an update on Peter Hubbard's V8 two stroke project. The issue is rounded off with all of the usual features including a lively letters page, interesting cars for sale, Jerry Sturman's senior moments column, Andrew Dinner's Pilbeam Ponderings and all the rest.